An educational tour of Vietnam narrated by anthropologist Manuel Arboleda G.
Nawpaq Expeditions invites you to take an unforgettable journey to the Legendary Land of Vietnam. Join us and experience the joy of traveling in a small and private tour that offers an all-inclusive sightseeing program with a bent on education. Our mantra: If it is worth seeing, it’s included. Our 15-day tour will take you from the mouth of the mighty Mekong River Delta to Hanoi and the Red River, all told a distance of some 1,300 kilometers. We will tour Imperial Hue and enjoy its spacious royal buildings, gardens and gates, all with striking Chinese influence. Navigate the meandering canals of the Mekong River delta and visit Cai Rang, one of the last authentic floating markets in South East Asia. Admire the ancient architecture of the Champa Civilization at My Son and relish its art laced with Hindu influence. Cross the Hai Van Pass of the forest-clad An Nam Mountains and enjoy the breath-taking view of its abrupt descend into the South China Sea. Explore Hoi An’s urban charm and Hanoi’s picturesque streets teeming with lakes and shady streets. 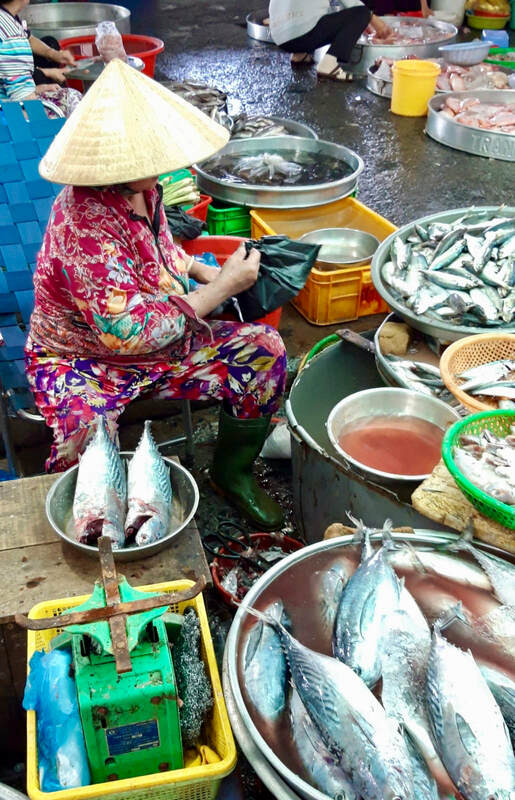 Mingle with Vietnamese vendors donning their conical hats in the various colorful markets. Experience the culinary delights of Vietnamese cuisine, one of the world's best, with Vinh as your narrator. And yes, cruise the emerald-colored waters of Ha Long Bay and see the soaring limestone formations containing deep caverns and caves teeming with lush vegetation (but in a less congested area). Rest assured that you will enjoy all of these activities that are usually not included in conventional tours. But hurry and sign up! Space is limited (maximum 18 paxs). Arrive sometime today. Our transfer person will be at the airport to greet you and take you to your hotel. Note: rooms will not be available until check-in time 13:00 hrs. For those of you who are joining us from Cambodia, you will have the remaining of the afternoon at leisure. Full-day tour of bustling Ho Chi Minh City, the financial capital of Vietnam. Once ruled by the French, the city still bears the trappings of French urban planning: shady streets sprinkled with colonial buildings, trendy cafes, and broad avenues punctuated by soaring Khaya Senegalensis trees and yes, tons of unrelenting motorcycles plying the city’s streets (and sidewalks!). Enjoy strolling downtown passing by the ornate City Hal; the Romanesque Notre Dame Cathedral; the imposing Opera House and the Vietnam-war era hotels located just off Dong Khoi St., the city’s main shopping thoroughfare. Then stop to visit the Post Office and the Reunification Palace. Stormed by soldiers of the National Liberation Front (NLF) in 1975, the momentous act put an end to the Vietnam Wars leading to the final reunification of the country. From here, we drive to the Ngon Restaurant, known for its diverse Vietnamese dishes, for our “welcome lunch.” We terminate our tour with a visit to the large Cholon Market (and its colorful Chinese temple) to view that large selection of items ranging from tee-shirts to tropical fruits and vegetables. Get set for an early drive to the renowned Cu Chi Tunnels. On our way, you will pass by a tropical landscape dotted with interminable rice fields that has transformed Vietnam into the 2nd largest producer of rice in the world! The tunnels, strategically built to resist the French occupation, were expanded to a network of some 150 kilometers long during the American War, as the Vietnamese call the “Vietnam War.” A small part of this network has been restored and opened to visitors to cast a fascinating light on the daily lives of the National Liberation Front (NLF) guerrillas and their undaunted spirit to resist, first the French, and then the Americans. From here, we will drive back to the hotel for lunch (on your own) and then reconvene in the afternoon to visit the impressive Remnants War Museum ” and its mind blowing war relics cleverly exhibited in dioramas, short documentaries and photos. All of which reveal the horrors of war, a human staple. Get set for a two-day expedition of the mighty Mekong River Delta. Spanning over 4,300 kilometers, the Mekong is the largest river in Southeast Asia. Our drive will take us to Cai Be town located deep in the Mekong Delta, an area that was once a stronghold of the NLF. On the way, we will stop for coffee and do a brief visit to a small Cao Dai Temple. Founded in 1926, Caodaism claims to be a synthesis of half- a- dozen faiths and, it was hoped, its fusion would lead to a universal religion. At Cai Be, we will embark on a private boat and navigate the amazing meandering canals of the mighty Mekong Delta. We then continue to Be Linh, an area flooded by endless rice paddies. Here, you will be treated to a typical Vietnamese lunch in the house of a former NLF guerilla. You will see his medals proudly displayed in a room specifically devoted to his ancestors, a common Vietnamese tradition. We will then end our cruise at Vinh Long and transfer to our bus for the short drive to Can Tho arriving there late in the afternoon. You will have the rest of the afternoon at leisure to enjoy the grounds of the beautiful river-side hotel. Today we will get up early and navigate to Cai Rang, one of last remaining floating market in Southeast Asia. Take your time contemplating the large flotilla of boats laden with tropical fruits, vegetables and other items. And don’t forget to look for the Service Boats. They are responsible for selling hot Vietnamese coffee, snacks and drinks to all the vendors. We will then navigate back to Can Tho stopping to visit the city’s exotic fish market. Here, you will see vendors displaying a wide array of live fish ready to be butchered alive for hungry consumers (see cover photo). We will then take a short walk to the hotel to freshen up in preparation for our long drive to HCM airport. But first, we will stop for lunch at the Mekong Rest Stop Restaurant and enjoy its fine selection of Vietnamese dishes (particularly its “Spring Rolls”). Enjoy a full-day exploring Hue, the capital of the Nguyen Dynasty (1802-1945 CE). Unlike the Cham and the Khmer Civilizations, the Nguyen emperors embraced Chinese culture and designed their imperial city to emulate Beijing’s “Forbidden City.” You will relish exploring the spacious courtyards, religious and ceremonial buildings including the harem built adjacent to the emperor’s quarter. Unfortunately, the U.S bombed the citadel during the 1968 Tet Offensive destroying most of the buildings in an attempt to dislodge the NLF guerillas from occupying the citadel. Then take a leisure cruise along the Perfume River to visit the towering Thien Mu Pagoda. Inside you will see the vehicle pertaining to the Buddhist monk Thich Nhat Hanh who, as an act of protest against President Diem's repressive policies, drove his car to Ho Chi Minh City and committed self-immolation (see the photo essay). We will then have lunch to sample Hue's regional cuisine and then off to explore the lovely grounds of the tomb of Emperor Minh Mang. Enjoy the manicured park replete with sculptures, gardens and ponds, all of which display rigorous Chinese influence. We terminate our tour with a private musical performance centered on the dan bau, the one-string musical instrument unique to Vietnam. Get set for a breath-taking journey from Hue to Hoi An a scenic drive that will take you up to the Hai Van Pass offering some of the most remarkable landscapes of Vietnam! We start ascending the Pass (technically a spur of the An Nam Mountain) at Lang Co beach. On our way, we witness the Pass dramatic plunge into the South China Sea, a scene that was immortalized in the 1992 award-winning film, Indo Chine. We will the reach the summit-stopping for photos-before descending to Marble Mountain, a sacred mountain where the Buddhist built a monastery. To be sure, even the ancient Cham felt its spiritual aura by carving Hindu shrines inside the numerous caves that dot the craggy mountain. We then reach the shore of China Beach which, from 1965 to 1973, served as a large "R & R" center for U.S troops and, not far from the beach, we find the recently renovated Cham Museum containing the world's largest collection of exquisitely carved Cham stone sculptures (over 300!). Enjoy seeing the Cham collection carved in low-relief displaying different waves of Hindu influence reminiscent of those found in Khmer sculptures. We then continue to Hoi An arriving there in time for a late lunch (on your own). Just one hour east of Hoi An lies the enigmatic ruins of My Son. Built in the 7th century CE., amid a lush green forest, it was the cultural and religious enter of the Champa Kingdom (7th to 15th century CE). Enjoy a walk through the forested and serene grounds of the site and marvel at the magnificent brick towers adorned with Hindu-inspired low-relief sculptures. Indeed, the towers, or Kalems, represent one of the most important Cham contribution to Hindu architecture. Unfortunately, most of them were destroyed during the American War, the landscape is still marred with huge craters created by unrelenting U.S bombs in a vain effort to dislodge the NLF guerillas. Then glance at the numerous stelas (upright monument) with inscriptions in both Cham and Sanskrit script commemorating the accession of Cham Kings and/or their military deeds. We will also to visit the small museum and enjoy a live performance of Classical Cham Dancing before departing for Hoi An in time for lunch (on your own). In the afternoon, we will engage in a walking tour of Hoi An’s “Old Quarter” to enjoy the city’s rich architectural tradition including the majestic Phuoc Kien Pagoda and the 400 years-old Japanese Bridge. In the evening, you may want to walk along the promenade to see a flotilla of petit floating paper lanterns illuminating the inlet with subdued lighting, a perfect drop for nocturnal photography. With its leafy streets, lakes and imposing colonial buildings, Hanoi easily qualified as a “World Heritage” site. Shortly after our arrival, we will reconvene for a cyclo ride through Hanoi’s old quarter to see, among other things, a procession of motorcycles carrying everything from furniture to live animals! Then we will take a walk along Hanoi’s legendary Hoan Kiem Lake, home to the “Cu Rua” aquatic turtle (who died recently), and finally, enjoy Hanoi’s unique Water Puppet Show. Get set for a full-day tour of Hanoi starting with a visit to the Ho Chi Minh Mausoleum containing the embalmed body of Ho Chi Minh (the “Father” of the country) It forms part of a beautifully landscaped complex that includes the renowned 800- year old One-Pillar Pagoda, the opulent former French Governor Palace and, in sharp contrast, the humble house of Ho Chi Minh where he preferred to live and work. Then off for lunch at the Yin Yan Restaurant followed by a visit to Confucious’ Temple of Literature where impressive rows of carved columns contain the teachings of Confucious, an influential Chinese philosopher whose teachings remain relevant today. Next, drive along the imposing Hanoi Opera House (a copy of Paris’ opulent Garnier Palace) and then stop for a brief visit to the old “Hanoi Hilton Museum where U.S prisoners of war were kept. Get set for a 3.5 hour-drive, paralleling the Red River, to Hon Gai Harbor in Bau Tu Long Bay. Once on board our comfortable 10-cabin boat, the Paloma Cruise, we will have lunch and then navigate the emerald-colored water of Ha Long Bay, a World Heritage site, that spreads over 1,500 square kilometers. Although technically submerged, these forest-clad limestone formations seem to spring out of the clear water creating spectacular backdrops. Indeed, some of islands contain huge caverns and caves teeming with stalactites that defy the imagination. You will have ample time to explore them and enjoy kayaking or swimming in the sandy beaches of Ha Long Bay as well. In the evening the boat staff will offer a variety of activities for your pleasure and entertainment. Our adventure continues with a visit to a large cave in Ha Long Bay, the Thien Canh Son Cave in the Hon Co Area. To reach the cave, we must climb over 100 steps but you will be rewarded once you reach the summit and enter the cave. Spiraling stalactites, formed by the action of dripping water, line the ceiling of the cave and natural light, emanating from the penetrating sun rays, seem to cast shadows on the stalactites forming different patterns of color, in awe of the forces of nature. We will then return for brunch and disembark for our trip back to Hanoi arriving there late afternoon. Today we will bid goodbye to our fellow travelers. Our transfer person will take us to the airport for our international flight home. Important: nearly all of the sites covered on this tour require moderate and, in some cases, strenuous walking. Climbing the uneven steps at My Son; walking on the pot-holed streets of Hue or Ho Chi Minh City; ascending the uneven steps of the limestone formations at Ha Long Bay etc., may pose a challenge to some participants. To remedy the situation, we will structure staging areas where the tour members can wait and not participate in a given walk or hike. We require a $ 250 USD initial deposit per-person to hold your space. The amount is fully refundable until 30 October 2019, the date in which we will release your funds to book your intra-tour air. The balance is due 45 days before the commencement of the tour (15 January 2020). …all of the land services which begin in Ho Chi Minh City and end in Hanoi. It is also guaranteed providing a minimum of 08 persons sign up. The tour includes all entrance fees; sightseeing services; special musical performance, the puppet show as well as transfers and rides in cyclo, buses and boats. Likewise, the tour also includes a Nawpaq Expeditions educational kit (eg. essays, maps) designed to enhance your cultural experiences as well as daily breakfasts and other meals as specified in the itinerary. …the “multi-city or open jaw” international airfare from your home country to Ho Chi Minh City and back (The fare averages $ 800 USD) and the two intra-tour air segments (average cost approximately $ 250 USD. The tour price also excludes tips to porters at hotels and airports, local guides, drivers, assistants and such personal incidentals as room service, laundry, telephone calls, alcoholic and non-alcoholic drinks, pre-tour inoculations, visas etc. With a few exceptions, Nawpaq Expeditiions only uses “four star” properties chosen for their location, price and service. Please refer to the name of the hotel in the itinerary for web information on each hotel.